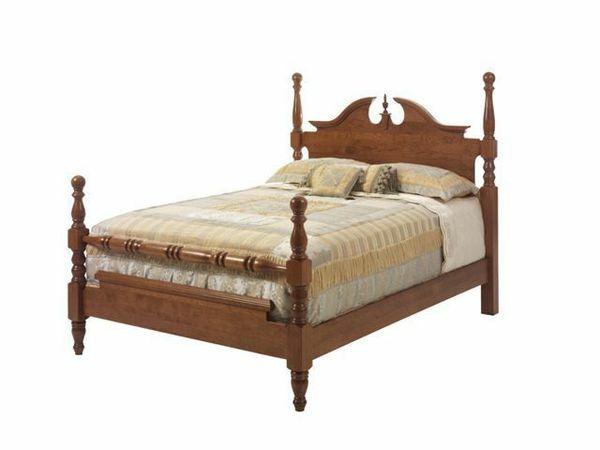 From the turned cannon ball posts to the flowing headboard with exacting, elegant detail, our Amish River Bend Cannon Ball Bed is the prefect example of Early American, Colonial style furniture. Crafted from solid hardwood, that was hand-selected for the natural beauty and longevity of each piece, your new hardwood bed will be an heirloom that you can keep in your family for generations! Transform your bedroom decor and add the rich, luxurious feel of handcrafted Amish furniture to your home with our River Bend Cannon Ball Bed! All of our beds in our Miller Bedroom Collection are made to your specifications, with an array of sizes, from Twin to California King, and an endless combination of hardwood and finish options, so you can be sure to find the perfect piece to fit your unique space. Add the decorative three-drawer storage units as a convenient way to incorporate more storage space under your new bed for linens and other bedding items right where you need them. If you have any questions about our River Bend Cannon Ball Bed, please call one of our Amish Furniture Specialists today. We offer hardwood stain samples for all of our beds, so you can be sure to have the perfect finish to incorporate into your home decor! Thank you so much for everything. Simon just delivered the bed and it is just beautiful! It is everything I was hoping for and such fine craftsmanship. Well worth the wait. It was a pleasure to work with everyone at DutchCrafters.